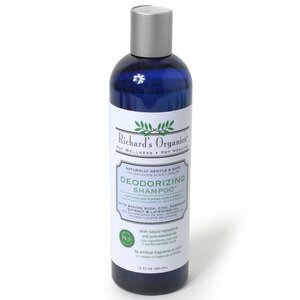 If you don’t take your dog to a groomer, or you are in between grooming appointments, and your dog needs to be clean, Richard’s Organics Deodorizing Shampoo may just be the answer you are looking for. Sasha is a roller, a roller in all things that smell like death or feces. The worse it smells, the happier she is to roll in it. Just the other day we were outside playing in a field and she stopped dead in her tracks, sniffed the air, and dropped and rolled for a good ten minutes. I usually can catch her before she does this, but this time she was just too fast. I hadn’t had the chance to use the shampoo I bought, so I figured this was as good a time as any. The fragrance was soft and pretty, and lasts quite a long time. It lathered nicely, rinsed out well and made Sasha’s coat quite shiny. My only complaint, and it is minor, is that it wasn’t very thick, so it seemed like I needed to use more than usual. The ingredients are fairly decent: Purified Water, Coconut Oil Based Cleaners, Glycerin, Sodium Bicarbonate, Aloe Vera, Siliconized Zinc, Rosemary Extract, Lavender Oil, DMDM-Hydantoin, Tetrasodium EDTA. Final verdict: I would recommend purchasing this to have on hand for those times when you can’t get to your groomer, or if you groom your dog(s) on your own. The smell is great and it lasts a long time (Sasha smelled good for almost a week). It was a good emergency product to have around. It is available on wag.com for a reasonable price.